We are excited to announce that the annual SKC Summer Camp has been confirmed with a special guest this year! 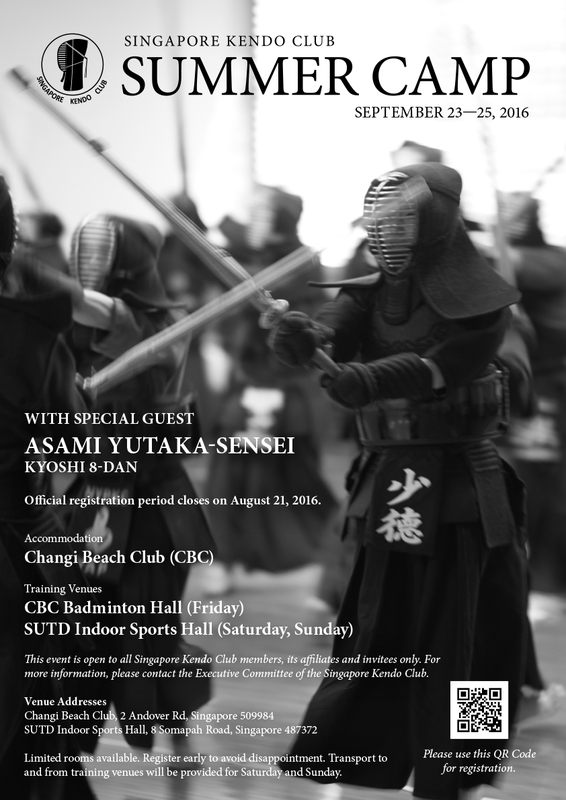 Asami Sensei will be joining us! Kindly register early to avoid disappointment. Registration is now open! REGISTER HERE (mobile friendly). Deadline for registration and payment is on 21 Aug 2016, Sunday. Booth will be set up at Changi dojo on every Sunday to facilitate payment collection and provide assistance in registration. For participants aged 16 & below, a copy of indemnity form signed by a parent/guardian is required. *Affiliate Clubs refer to Tanglin Kendo Club, NUS Kendo Club, NYP Kendo Club, SMU Kendo Club, ITE West Kendo Club, and ITE East Kendo Club. + Accommodation capacity is limited, hence priority is given to those who has completed online registration and submitted payment. Lastly, all meals (halal) are provided. However, if there is any day(s)/meal(s) you will not be able to enjoy it, kindly make a note during registration to avoid food wastage. Love food, reduce wastage! Let’s countdown to Summer Camp together!